The White House, the official home and workplace of the President of the United States of America. The White House is the combined home and workplace of the President of the United States of America and his family. The term the "White House" is often used to refer to the office of the presidency, or the president and his staff, as in "the White House had no comment on the controversy." The official street address of The White House is 1600 Pennsylvania Avenue, NW, Washington, DC 20050, the same wide avenue that connects directly to Capitol Hill (Congress). on the same wide road as the Capitol. While every president since John Adams has lived in the White House, it is not a requirement for the President to reside there. Harry Truman lived across the street in the Blair House (also owned by the government) while the White House was thoroughly renovated in 1949-52. Its history, and the history of the nation's capital, began when President George Washington signed an Act of Congress in December 1790 declaring that the federal government would reside in a district "not exceeding ten miles square…on the river Potomac." 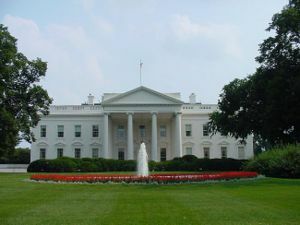 President Washington, together with city planner Pierre L’Enfant, chose the site for the new residence, which is now 1600 Pennsylvania Avenue. As preparations began for the new federal city, a competition was held to find a builder of the "President’s House." Nine proposals were submitted, and Irish-born architect James Hoban won a gold medal for his practical and handsome design. Construction began when the first cornerstone was laid in October 1792. George Washington ordered the construction and helped to choose the site while he was president. Adams and his wife Abigail, moved into the mansion while it was still under construction. Thomas Jefferson was among the many people who submitted a plan for the White House. His design, however, was not chosen. Instead, James Hoban, an Irish immigrant architect living in Charleston, South Carolina, won the competition and a $500 prize, with a design modeled after Leinster House in Dublin, Ireland. The original name was the Presidential Palace or President's House; it acquired the sobriquet The White House after it was burned by the British in 1814 during the War of 1812, and subsequently covered over by white paint to hide the exterior scorch marks. In 1901 (1902? ), President Theodore Roosevelt officially gave the White House its current name. The White House is 85 feet 6 inches (26.1 meters) wide without porticoes; 152 feet wide with porticoes. The overall height of the White House (to the top of the roof) is 70 feet on the south and 60 feet 4 inches on the north; the façade (grade of lawn to parapet) is 60 feet on the south (lawn at 54 feet above sea level) and 50 feet 4 inches on the north. It takes 300 gallons of white paint to cover the exterior of just the residence portion of the White House (center), excluding the West and East Wings. The White House fence encloses 18 acres of land. William M. Harnett's "Cincinnati Enquirer," on display at the White House. The White House has (excluding storage rooms): 10 rooms on the Ground Floor, 1 main corridor, 6 restrooms; 8 rooms on the State Floor, 1 main corridor, 1 entrance hall; 16 rooms, 1 main corridor, 6 bathrooms, and 1 restroom on the 2nd floor; and 20 rooms, 1 main corridor, 9 bathrooms on the 3rd floor. Line of Rise: 16' 7" (5.0m) the point at which the ceiling starts to arch. Workers from a number of federal departments work at the White House, and the two most notable are the executive office of the President and the Secret Service (which is a part of the Department of Homeland Security). Congress requires the President to report annually on the salaries paid to the 377 employees in the executive office of the President, which includes 22 people earning the maximum salary of $179,700. ↑ The Cornerstone Of The White House. ↑ White House Historical Association. ↑ https://www.whitehouse.gov/sites/whitehouse.gov/files/docs/disclosures/07012017-report-final.pdf Retrieved July 1, 2017. This page was last modified on 9 April 2019, at 17:54. This page has been accessed 46,346 times.